Thailand conjures differing images for everyone...sweet curries, golden-robed monks, tropical island paradise, soft smiles, and musky Bangkok. However, this tour journeys through the cultural, spiritual, and historical heartland of the country where few travelers go. Even if you've traveled to Thailand before, this journey will reveal a country you have likely never seen or imagined and in the most intimate way possible, by bicycle. And if you've heard or been on our other tours, you know we've put together designed and lead by people who love biking and travel. Our cycling route meanders through verdant untouristed, rural routes where one can eyewitness firsthand the robust culture and everyday life in remote towns and villages. We ride the fertile plains flanked by mountain ranges and crossed by major rivers, canals and tributaries all contributing to the creation of lush landscapes. Under a brilliant sun, we cycle and visit the real Thailand where farmers work the land, graze their buffaloes or laze in their bamboo shelters where life has changed very little over the centuries. Along the way, there will also be the unparalleled beauty of Thailand's shimmering antique temples, vibrant art, succulent cuisine, and hospitable people who see few pass this way. 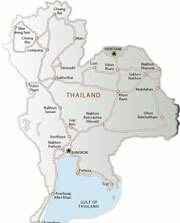 These two, spectacular weeks bring us in touch with some of the most unique and memorable characters in northern Thailand, where Chiang Rai, Thailand’s northernmost province, borders Burma (Myanmar) on the west and Laos on the east to create the infamous ‘Golden Triangle’ — a perfect place to gain a taste of northern Thai life. Using bicycles as our main form of transport and fun, we’ll see the many faces of Chiang Rai province, from jungles and hilltribe villages to multi-cultural mountain communities and enchanting life along the Mekong River. Our interest in arts will lead us to modern Thai craftsmen, inheritors of cultural traditions, displaying their talents in intricate woodcarvings, fine gold and silver jewelry, delicate hand-woven silk, leather puppets, basketry, pottery, hilltribe embroidery, and a dozen other art styles. Add to it a wealth of "outsider" folk craftsmen who decorate even ordinary utensils, as well as numerous culturally distinct tribal peoples, each with their own distinctive arts and styles and you have the diversity that is Thailand. Most impressive to those have have not been before is witnessing firsthand how Thailand's Buddhist nature permeates their society. We will explore the heart of Buddhist spirituality in Thai culture in the many temples along the way, experiencing the daily life of it's pious monks. We will also of course enjoy and study the crowning glory of Thai culture — its superb cuisine — in carefully planned meals highlighting local and regional specialties. Cooking and an informal "survival" Thai language class will enhance our culinary and cultural journey. Combine this tour with 3-days of kayaking in the Khao Sok nature preserve with Dave Williams before or after your trip, a perfect experience in the southern islands if you're not the type to lay on the beach.